Happy Tuesday, Everyone! Is anyone else over Winter? Personally I would like one medium sized snow storm and then blossom into Spring. The best thing for me about the cold weather is toasty fires and homemade soup. This all vegetable beef soup is one of my favorites…. I’ve shared a version of this recipe before. My husband and I have been trying to watch our carbohydrates so I took out the potatoes and corn and replaced them with other fresh vegetables. This time I used zucchini, bell peppers and added a can of cannellini beans. Aren’t fresh veggies pretty? The addition of the beans makes it extra hearty. Directions: Brown ground beef, onion, garlic and jalepeno pepper in large pot. Drain grease. Add remaining ingredients and cook until carrots and veggies are tender crisp. (about 30 minutes). You can add more V-8 juice if you like a little more juice in your soup. 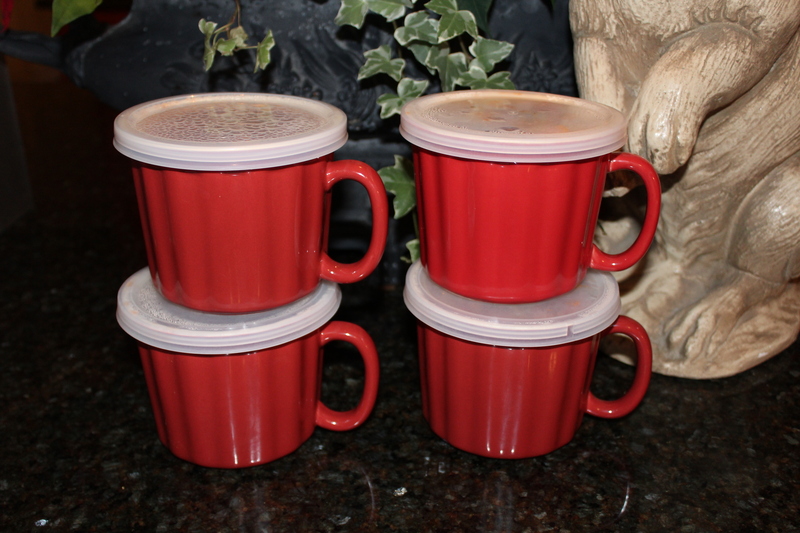 Tip: I like to put the leftovers in these handy little containers with lids. They are microwave/dishwasher safe and hold a perfect single serving size. I bought them at my local grocery store.